While looking after my nephew recently, we visited a local park. 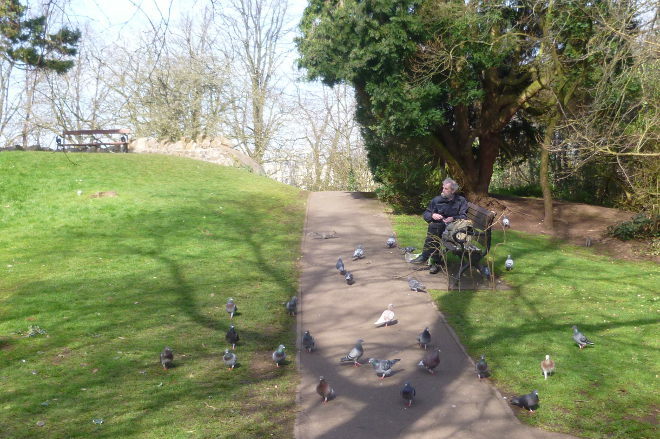 An old man was minding his own business feeding pigeons and squirrels from a carrier bag of monkey nuts. My nephew wanted to make friends with him and help feed the wildlife, but it was clear the gentleman wanted only to be left alone. I got the impression this is something he does every Saturday, or perhaps every day, and that it is a source of rare pleasure to him. I also had the sense he prefers animals to humans and has perhaps learnt to be wary of people. It made me wonder what his story is, whether he lives alone, or may even be homeless. How did he come to be like this? What might happen if a child insisted on befriending him?